Space/Terrestrial Mobile Networks Internet Access and QoS Support covers the design of a Global Mobile Broadband System (GMBS) based on the results of the European Commission's Framework Programme 5 Information Society Technologies (IST) Project SUITED. Many of the latest concept in mobility solutions, network design techniques and internet technologies are presented. The SUITED project has addressed a number of technical issues that are very much state-of-the-art. The presentation of such material in the form of a design of a real network provides a unique source of information. 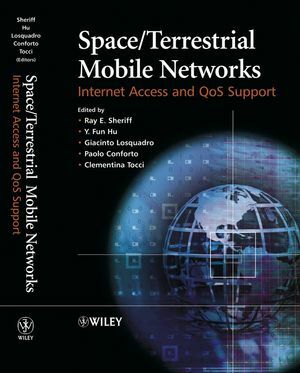 Space/Terrestrial Mobile Networks Internet Access and QoS Support has an accessible and practical approach to the subject and addresses in detail, the important topic of heterogeneous networks and the underlying technologies that make this concept possible. Ray E. Sheriff is the editor of Space/Terrestrial Mobile Networks: Internet Access and QoS Support, published by Wiley. Y. Fun Hu is the editor of Space/Terrestrial Mobile Networks: Internet Access and QoS Support, published by Wiley. 5. End-to-End Qquality of Service Support.